Are you living paycheck to paycheck and struggling to make ends meet every week? You know the drill, you get your paycheck, pay some bills, buy groceries, then the money is gone until the next payday. Then you do it all over again, week after week. You know as well as I do that this is no way to live your life. It’s very stressful and one just one little unexpected expense could truly turn your finances upside down and send you even further in debt. Even if you feel that you can’t get ahead, there are many things that you can do to turn this around. With a bit of hard work and a change of attitude towards money, you can break free of this vicious cycle. Here are some tips that you can start doing today to break free of living paycheck to paycheck once and for all. If you want to change your financial situation, you need to change your whole attitude about money. Money should not be ruling your life, you should be in charge of your money. You need to take a hard look at how you handle your money. Does this sound familiar? I’m sure it does! The truth is that all those five bucks add up over time! And, yes, you can absolutely do something about the rising cost of your cable bill. You can shop around for a better rate, you can give up some of the costly cable packages that you’re paying extra money for. You could even get rid of cable altogether and opt for one of the less costly options such as getting a digital TV antenna or a Roku TV streaming player. The total amount of money wasted in just these two small examples costs about $500 a year. Now, imagine if you applied this to all aspects of your finances, it would add up to a whole lot of extra money! There are many small changes that you can make that can really add up and make a huge impact on the amount of money that you can save. Your cable bill is just one example of making small changes—yes, I know, for some of you it’s a big change. Making small changes doesn’t mean that you will have to deprive yourself of anything. You just need to look for cheaper alternatives to some things that you spend your money on daily, and you can still meet our needs and save money too! For instance, take those specialty coffees daily, you can by flavored coffee for less than $10 a can or creamers in your preferred flavor for less than $5. At the rate of one specialty coffee a day, these two options would last you over a month, so you would spend $15 a month making them yourself at home instead of wasting about $90 a month for purchasing ONE daily drink at your local coffee shop. Cha Ching…about $75 a month saved on one item alone. Check out "Simple Changes That Will Save You Hundreds Every Month" where I share more easy ways to save money. I know that most people hate to think about creating or sticking to a budget. The thing is, you need a budget to keep track of where your money is going and to stay on track of your finances, there is just no getting around it. The reason that so many people fail at budgeting is because they create such an unrealistic budget that they are doomed to fail right from the start and give up. The key to creating a budget and sticking with it is to make one that will give you some wiggle room. This way, you won’t throw your hands in the air and give up after just a few weeks. Your budget is a work in progress, especially when you’re first starting out. So, if you see that certain areas are just not working for you, then you should make some changes and tweak it until you find what works best for you. If you have attempted to budget and end up giving up time after time, read “6 Reasons Your Budget is Failing and How to Fix It” to learn how to stick to a budget at last. It is so critical to have an emergency fund. As you know, if you’re living paycheck to paycheck, if you have one or two unexpected expenses, it could throw your finances into a downward tailspin. You can end up creating more debt that you don’t need or having to skip paying a bill or two to pay for these expenses. This will have you ending up wasting more money when you get hit with excessive late fee charges and interest rate hikes. You need to make sure that you add emergency savings into your budget. If you can contribute at least $20 a week, you will have over $1000 saved in one year. Better yet, open a high yielding savings account to grow your savings even faster. Why not take advantage and earn free money to build your emergency savings? If you have debt, then you need to get rid of it. This is the reason that you’re living paycheck to paycheck. You’re wasting your money by paying high interest on this debt. It’s like taking your money and burning it. Try to get rid of your debt as fast as you can. You need to make sure that any extra income in your budget goes towards paying off your debt. Make an action plan to get your debt paid off and stick to it! I have a post that will show you "How to Get Out Of Debt Even When You’re Broke" that will help you pay it off fast. If you just can’t balance your budget or don’t have any room in your budget to save or pay down your debt, then you should consider taking on a side hustle to earn extra money. There are many things that you can do in your spare time to earn extra money, even if you don’t have a lot of time to spare. Every little bit that you can do now will help you on your mission to stop living paycheck to paycheck. Here are a few posts that can help you earn extra money to contribute to your savings. 24 Side Hustle Ideas—This is a great list of different types of jobs that you can do in your spare time. How to Sell Your Stuff to Make Money—Selling stuff that you no longer use can help you make money to pay down your debt or put into your emergency fund. 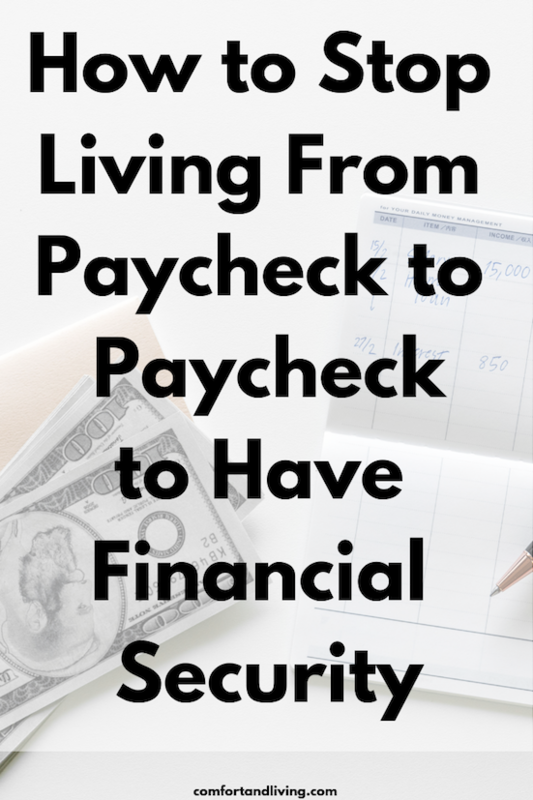 Breaking the cycle of living from paycheck to paycheck isn’t easy at first. Trust me when I say that it gets easier as time goes on and it’s definitely worth it in the end. Don’t give up. There is so much more to life than worrying about paying the bills.